Friday 23 November 15.00-17.30 in Sala degli Stemmi (Villa Salviati), EUI, Florence. Hart/Bloomsbury recently published an edited volume on Nordic Constitutions. This book analyses the Nordic constitutional systems of Denmark, Finland, Iceland, Norway and Sweden in a comparative context. It has two main aims: first to fill a gap in the literature by providing an accessible English language account of the Nordic constitutions, and second to provide a comparative analysis of them, revealing their similarities and differences within their political, historical and cultural contexts. In this respect, the book challenges the assumption that the Nordic countries form a homogeneous constitutional system due to their cultural and historical affinities, a view not necessarily supported by a close comparative examination. A key issue is EU membership –where the Nordic countries have made different choices at different times – and the book will show how this has affected the individual countries and whether a divide between EU member states (Denmark, Finland and Sweden) and non-members (Iceland and Norway) has appeared. Another key issue is how the ECHR has impacted the Nordic constitutional systems and whether the convention draws the Nordic systems closer to each other. The book represents a first of its kind in the English language, and will provide constitutional scholars with a valuable comparative resource on the Nordic region. During this event, the book will be presented by its two editors, Professor Helle Krunke(University of Copenhagen) and Professor Björg Thorarensen(University of Iceland). Of the authors, also Professor Tuomas Ojanen(University of Helsinki) will be present. Professor Janne Salminen(University of Turku) will act as commentator. The event is hosted by Professor Martin Scheinin and it will be followed by a small reception. Kirsty Hughes (UK), Privacy, Mass Surveillance and the Role of the European Court of Human Rights? Location: University of Maastricht Campus in Brussels. Privacy. One of the most important topics of the 21st century. Personal data is the new oil and all the new innovative ways in which it is used push the limits of privacy. The world is going digital and therefore the matters of privacy should be examined thoroughly. The new General Data Protection Regulation keeps everyone on their toes. Research on privacy has become more significant than ever before. Privacy researchers are working on answering and discussing questions that rise from the new frontiers of digitalization. 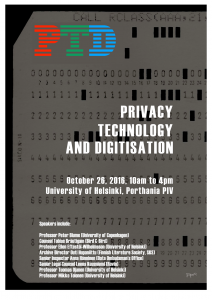 IAPP, Faculty of Law, and LOSS Project at University of Helsinki decided to bring together privacy researchers to a Town Hall seminar. In an upcoming seminar, our moderators Milla and Tobias will be interviewing four privacy researchers about their recent work. This event will move away from the traditional “presentation and questions” approach and instead use an interactive interview and “town hall”approach. The privacy seminar will begin with an interview of a particular researcher, after which audience members will have the chance to ask follow up questions via FLINGA. This will allow for an engaging discussion, aimed at researchers, students and professionals. We will cover questions like Bots and AI, MnA and privacy, privacy enhancing technologies and fundamental rights. More information on the speakers and topics coming up! Where? Porthania (Yliopistokatu 3), PII. Defence of Doctoral Dissertation: The End of Freedom in Public Places? On the 24th of March 2017, LOSS-Project Researcher Jens Kremer defended his dissertation ‘The End of Freedom in Public Places? Privacy problems arising from the surveillance of the European public space.’ Professor Iain Cameron from Uppsala University, served as the opponent. The dissertation is published with Unigrafia and can be accessed here. This dissertation analyses specific privacy problems arising from the surveillance of public spaces. It studies the scope and limitations of the human right to privacy and a right to personal data protection in light of advanced surveillance and security technologies. 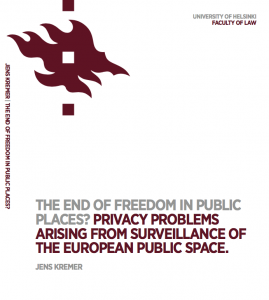 The main research question therefore asks how the existing European fundamental rights to privacy and data protection address increasing surveillance and the unprecedented surveillance capabilities of public spaces in Europe. This study is divided into two main parts. After introducing the research problem and a descriptive discussion of existing and future surveillance technologies, the first part discusses the theoretical conceptions behind this research, namely the concept of public space, privacy, data protection and security. Part two of this study then discusses four more specific issues in relation to public space surveillance: Individually targeted surveillance, mass surveillance, surveillance done by private actors, automation of surveillance, and incident prediction. In order to address the research question, this study analyses existing legislation, jurisprudence and specific cases. The overall framework for analyses is derived from a fictional urban surveillance scenario, representing a large European city. This surveillance scenario serves as an anchor point to identify central problems and issues for further fundamental rights based analyses. In that sense, this study uses legal and critical analyses of a specific scenario in order to identify existing, but also potential future legal problems arising from sophisticated public space surveillance. This study consequently identifies several ways to address public space surveillance from a European fundamental rights perspective. The analyses of a right to privacy and a right to personal data protection show that the European system of fundamental rights protection is very well capable of addressing legal problems arising from public surveillance. However, there is a lack of available case law dealing with complex technological surveillance in Europe. This study therefore distils two main approaches for addressing public surveillance: The first approach is based on individual freedom, relying on the legitimate expectations of legal subjects, the second, which is derived from human dignity and personality rights, challenges the communal effects of surveillance. Each approach comes with a fundamentally opposite take on public surveillance. Furthermore, this study shows, how data protection functions as a gap-filler between the two approaches. In its conclusion, this study therefore illustrates several ways to address public space surveillance, and it shows that there is a series of legal problems arising from sophisticated technological surveillance, which require a reformulation of legal arguments addressing public place surveillance. The University of Turku, including its LOSS-team, are organising a conference on Digital Rights, Markets and Innovation on the 1st of December 2016, followed by a workshop for Doctoral Candidates on the 2nd of December. The Conference forms part of University of Turku’s cross-disciplinary profiling and strategic research area Digital Futures. It is funded by the Faculty of Law at the University of Turku, Strategic Research Council at the Academy of Finland -funded research project Digital Disruption of Industry and Academy of Finland -funded research projects Constitutional Hedges of Intellectual Property and LOSS Project Turku. In the workshop, doctoral students will present their papers related to the themes of the conference. Papers to be presented will be chosen on the basis of their thematic connection to the conference and stage of research. Send your max one page abstract to Ms. Gail Maunula gail.l.maunula@utu.fi by 31 October 2016 at the latest. Acceptance letters will be sent on a rolling basis to accepted presenters. The selected doctoral students are expected to send a working paper of max 20 pages to Gail Maunula by 18 November 2016 at the latest. in Helsinki. The seminar assembled scholars and practitioners to discuss current issues related to technology and digitization. The interdisciplinary event brought together legal scholars, scholars from other disciplines and practitioners (industry, advocacy, and government). The aim was to foster new connections and inspire creative debates between academia and practice. Counsel Tobias Bräutigam (Bird & Bird): GDPR – what are key concepts on how to regulate information? Senior Legal Counsel Leena Kuusniemi (Rovio): Technology – enabling or limiting rights? On the 12th of May 2016, the LOSS Project held a one day seminar with a panel debate titled ‘Hate Speech Online: Regulation, Liability and Fundamental Rights’. While organising the academic events, LOSS Project’s goal is to bring together specialists from various fields and diverse backgrounds. This time we welcomed experts on the topic of hate speech online from academia as well as practitioners from grass-root level, such as Tarlach McGonagle, Institute for Information Law in Amsterdam, Adeline Hulin, Division of Freedom of Expression and Media Development UNESCO, Secretary General of the Finnish League of Human Rights Kaari Mattila, Tommaso de Benetti, game developer Housemarque, Karmen Turk, litigation attorney and others. The seminar was concluded with a panel debate, which explored the most effective ways to tackle hate speech in the online environment. We thank all the presenters, panelists and participants for their contributions! The seminar’s program is available here. 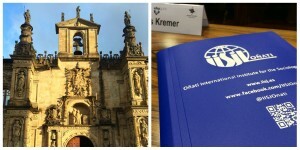 LOSS project researchers visit the Oñati International Institute for the Sociology of Law on the 16th and 17th of February 2016. Eliška Pírková and Jens Kremer participate in the international workshop Ultima Ratio III, hosted by the Institute. Their presentations ‘Regulating Hate Speech Online in the Digital Age’ and ‘No, you can’t film this! Private Security Operations and Compliance with new European Data Protection Standards‘ take place in front of an international audience of Criminal Lawyers and Researchers on Wednesday, the 17th. The LOSS- Project organized a Workshop and a Panel Debate on comparative perspectives of Surveillance, Privacy and Transatlantic Data Flows at the University of Helsinki on the 24th of November 2015. The day was a great success. It brought together well over 50 participants who were a representative sample of academia, decision-makers, law enforcement professionals, technology developers, private sector and NGOs. The participants reflected the close links LOSS has with a number of key stakeholders, as well as proved that the LOSS project is not only capable of providing a flow of information from its research activities to relevant stakeholders but also greatly benefits from their input and feedback for its own work. One of the many aspects discussed in the Workshop was the recent CJEU Decision on the EU-US Safe-Harbor Agreement. Federico Fabbrini, Bilyana Petkova, Tuomas Ojanen, Samuli Miettinen, Tobias Bräutigam, and Niklas Vainio were presenting ideas and research and discussed them with the participants. In the afternoon, the workshop concluded with a panel discussion posing the question: What data protection laws do we need in the 21st century? 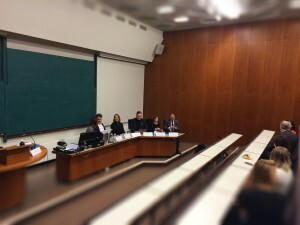 The panel included a variety of experts in the field namely, Leena Kuusniemi, Senior Legal Counsel, Rovio Entertainment Ltd, Iiris Keino, Associate, Dittmar & Indrenius, Jyrki Kasvi, MP, Bilyana Petkova, EUI, Juha Lavapuro, University of Tampere, Olli-Pekka Rantala, Ministry of Transport and Communication, and Jens Kremer, University of Helsinki. We thank all the presenters, panellists and participants for their contribution to making this a successful event! The workshop and panel on 24 November was the third and final event organized by the LOSS-project in 2015. The first year of the LOSS project has been very fruitful and rewarding. In 2016, at least two international seminars or workshops are scheduled to take place. Check out this website for information about the LOSS-project’s forthcoming seminars and other activities. We wish all partners and stakeholders all the best and look forward to your input and feedback in in the future, too! Merry Christmas and Happy New Year 2016!